I am partial to soybean foods: bean curds, tofu, soy milk, bean curd sheets, bean curd sticks, and vegetarian food made of soybeans. I consume these products a lot; as a matter of fact, I drink soy bean milk every day and I can’t live a week without soy sauce. Bean curd sticks (known as “Teik Gah Kee” in Hokkien, or “Foo Chuk” in Cantonese) is one of my favorite soybean foods. A great soup should have a somewhat clear broth; the soup base shouldn’t look overly cloudy or murky. 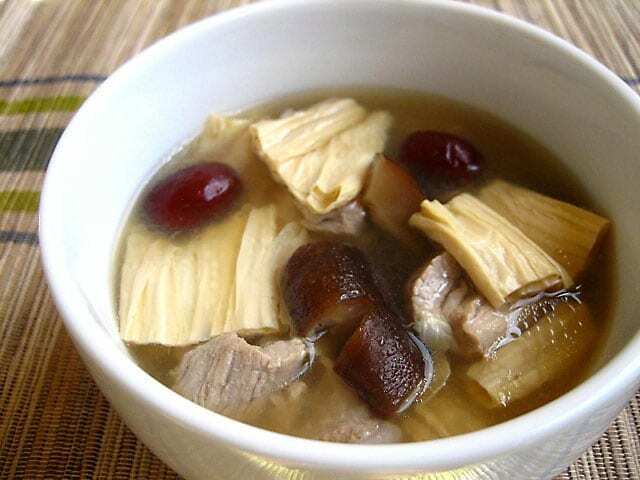 A great soup should also retain all the essential essence of the ingredients–in this case, the meaty taste of pork ribs, the delicate sweetness of dried red dates, and the unique taste that is of the beancurd sticks. This soup is certainly not my typical 30-minute meals, but it sure ranks high in my favorite food list. Bean curd sticks soup is certainly my comfort food; I appreciate the warming effect it brings on a cold day. Soak the bean curd sticks in warm water for 1 - 2 hours. (The time required to soften the bean curd sticks varies on the brand you get.) Once the bean curd sticks are softened, cut them into 2-inch strips. Soak the dried mushrooms until they become soft and spongy. Cut them into small wedges. Cut the pork ribs into pieces. Set these ingredients aside. In a pot (I used a normal pot), heat up the water and wait for it to boil. As soon as it boils, add the pork ribs. Boil the pork for 10-15 minutes and spoon off the foams that surface. 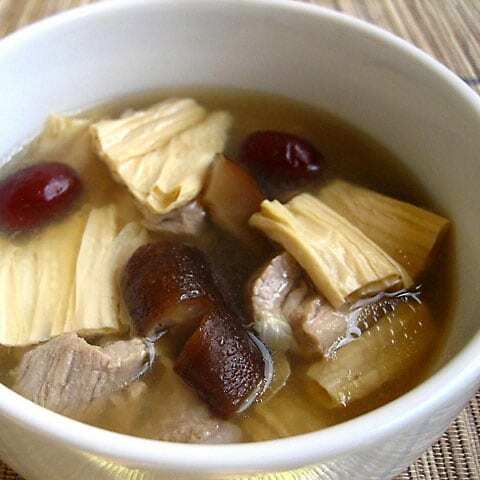 Add in the bean curd sticks, dried mushrooms, and red dates and simmer over low heat for 1-2 hours. Add salt to taste and serve hot. Ooooh, I like this soup, but you can’t find it at restaurants though…so have to cook it at home. May – you are correct; I never see this soup at restaurants either. I certainly would..! thank you again..! and the reason why i am saving the fu chook is because .. asian grocery store is 4hrs away from where i am currently living. Heart warming soup, hmmm sounds great for cold winter days. Haven’t made this for sometime. Thanks for reminding me :D. I bet this is a good time for long simmering stews and casseroles uh? Mama Bok – which part of Canada are you in? 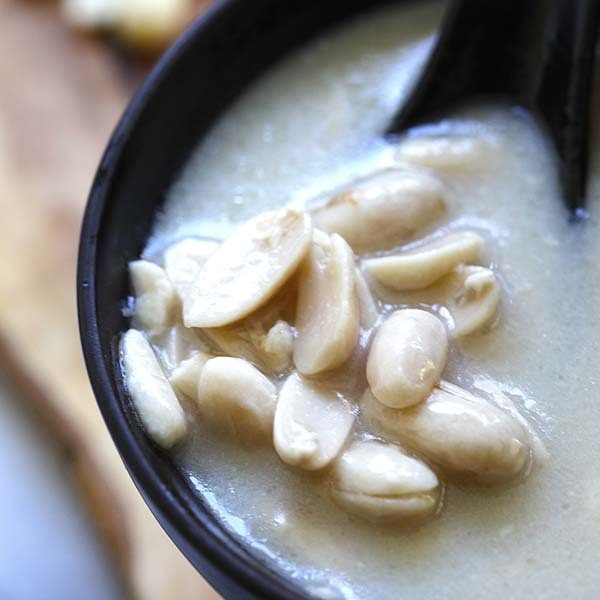 Wow, this time of the year must be super freezing up there…yes, cook up a big pot of this beancurd sticks soup. 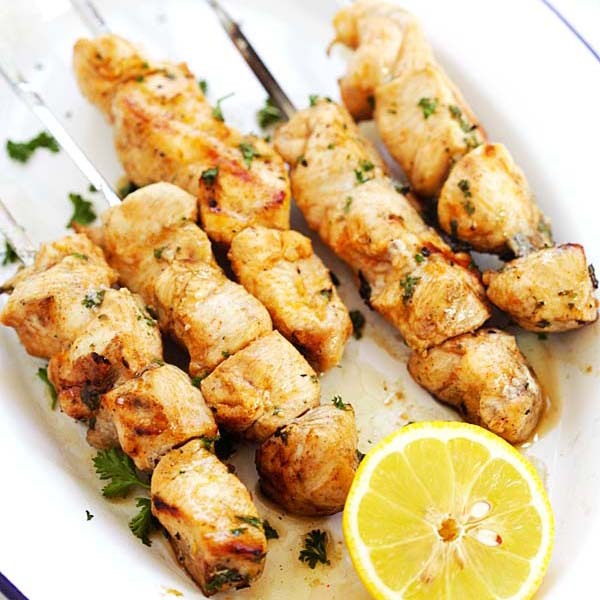 Paati – I have never tried with beef. I would suggest replacing the pork ribs with chicken actually. If you want a shortcut, you can use 1 can of chicken broth, then add another can of water to dilute it. Then cut your chicken meat (I prefer breast meat in this soup) into small cubes and bring them to boil. The rest stays the same. You know, I met a Hokkien lady from Singapore in Santa Cruz a few days ago. I had no idea how similar that dialect was to Taiwanese, but she understood every word I said and was able to response in her oddly accented dialect. I guess it makes sense ’cause they’re both from the Hakka language group. It now makes a whole lot more sense why so many of the Chinese or nonya dishes you present seem so familiar. Hey, you are Kaki Lang (own people in Hokkien!). Actually, Hokkien dialect is my mother tongue, but my Hokkien is Penang Hokkien– accent is completely different and we speak faster. I can understand Taiwanese dialect too, and you should be able to understand mine! See, once upon a time ago, our Chinese ancestors fled China in favor of the “gold” (opportunities) in Nanyang (南洋）hence they ended up in Malaysia and Singapore, etc. Then they intermarried the locals (Malay women) and started cooking up Nyonya dishes (Straits Chinese dishes). Also, most Chinese immigrants came from the Fujian region in China so our dishes are similar to Taiwanese dishes as the “root” is the same! Gorgeous Rasa Malaysia! My mom makes soup with red dates, and I love the sweet and concentrated flavor. Looks so beautiful and delectable. Thanks again for the wonderful recipe! Can you get those chinese herbs easily from Irvine ? I’m looking for those pre-packed herbal mix in the Bay Area now. Hope it’s as easy to find as in Singapore. PE – always a pleasure. Tigerfish – For pre-packaged herbal mix, I would advise you to head over to Chinatown. That bean curd sticks and pork ribs soup look lovely. Thank yu for sharing the recipe. Hi, I love your blog, it is so helpful. I am wondering about you drinking soymilk everyday. Do you have a machine to make it? I love soymilk too, but just don’t know which machine is good so I can make it fresh everyday. What do you recommend? Thanks so much, love your pictures and recipes. I have made this soup once every week for a consecutive 3 weeks times and am still liking it so much. This soup is definitely good, not only that it is extremely flavorful, it is also light and clear, perfect to enjoy at any seasons, especially in a hot summer day. 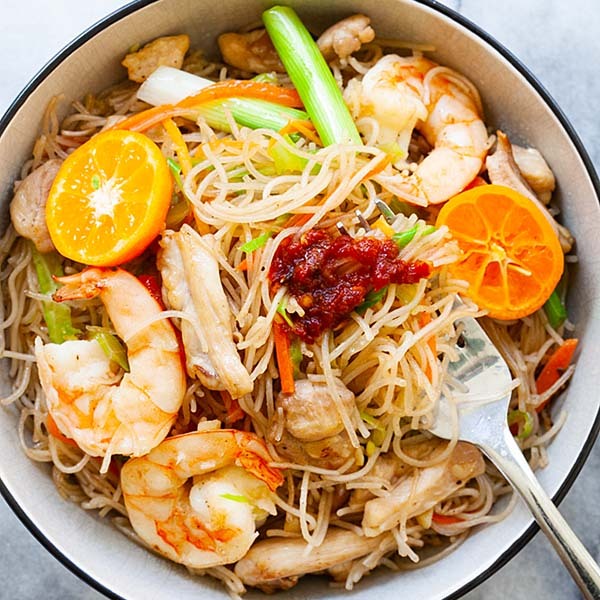 I like this recipe, but it’s hard to find the reddates and dried bean curd sticks, even in my asian supermaket (which is usually great!). As these are main ingredients in the dish – I guess there are no alternatives? Sorry no you have to use bean curd sticks. Try shop/store selling Chinese medicine(nyok choy poh). i have a question, i don;t eat pork. Can i change it to Chicken or other met parts? Can i not pit in the red dates? I really enjoyed this soup Malaysia! The grapes were very moist and sour perfect for my taste buds. The sticks are very crunchy and succulent, I have made this soup for my husband Stevo many times and he burps every time. He is a great hubby since this dish has placed me on the toilet many a time. I have been eating and now making this soup all of my life. My Grandmother was Chinese so my Mum cooked a lot of traditional Chinese dishes that you don’t see in restaurants. Our version is somewhat different. We cut up chicken and pork, put it into a large boiler, add garlic, onion and bean curd sticks and salt. Add a generous amount of water or chicken stock, I use both. Boil for about an hour or until the pork is tender. Add the red dates about 20 minutes before serving. We don’t soak the sticks. The dates tend to break up if added to early. We serve over rice and sprinkle with chopped spring onions. 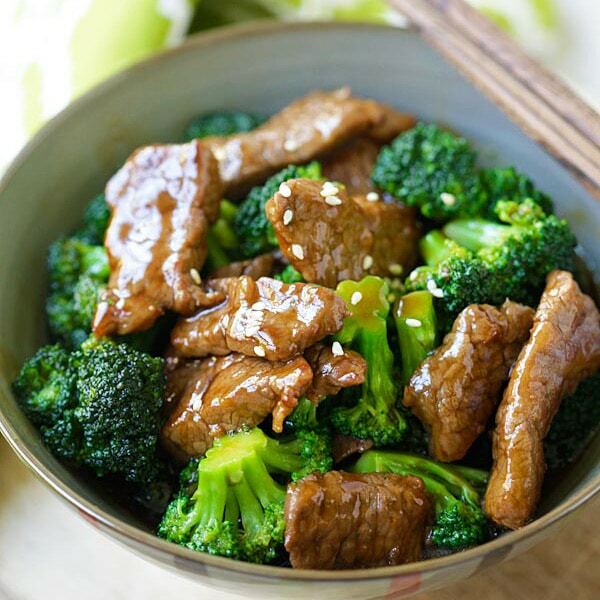 Soy sauce goes well with it. Everyone loves it, my Grandchildren, 6 of them, all request it for their birthday dinners.